For the first time in Peace Corps history the nominee for Peace Corps Director had votes cast against him in the Senate Foreign Relations Committee. The discussion of his nomination in full committee became very heated with strong opinions on both sides. In the end, the Senate Foreign Relations Committee approved the nomination of Gaddi Vasquez for Peace Corps Director by a vote of 14 for and 4 against. Although eighteen other nominations were approved by unanimous consent without discussion and one other nomination to the Inter-American Bank was discussed and voted on, the nomination of Gaddi Vasquez was the focus of discussion at the meeting of the Committee in Room S-116 of the Capital Building. Senator Rockefeller began by making the case against Mr. Vasquez. Senator Rockefeller began the discussion by making the case against Mr. Vasquez saying he wanted what was best for the Peace Corps, that Jack Vaughn and Sargent Shriver were both against the nominee and that it was unprecedented in Peace Corps history for two former Directors to oppose a nominee for Peace Corps Director. He added that Mr. Vasquez had no management experience, and that he was unqualified for the job. Senator Dodd said his nomination was troublesome but to give him a chance. Senator Dodd stated that he had a letter by Sargent Shriver and a copy of the speech Shriver gave at Yale earlier in November that he wanted read into the record. Senator Dodd said that he had served in the Peace Corps and that it had a special place in his heart, but that the nominee was supported by both Senators from his home state of California (Senators Boxer and Feinstein) and was also supported by most Hispanic groups. He put a stack of emails on the table and said that he had received many emails from returned Peace Corps Volunteers opposing this nomination. He said that the nominee had not picked up on the opportunities he had given him in the hearings on November 14, that he lacks experience in international relations and lacks experience in the Peace Corps. He went on to say that the Best Director the Peace Corps ever had was Loret Ruppe Miller who also lacked qualifications for the job, so he said although Mr. Vasquez's nomination is troublesome, he was going to give him a chance. Senator Boxer said the campaign against him by RPCVs was cruel and unfair. Senator Boxer said that the campaign against Mr. Vasquez was very unfair and very cruel, that she herself had been a County Supervisor and that the County Treasurer makes the investment decisions, that she had never heard of one case where the Supervisors were held responsible for bad investments, that all the supervisors were exonerated, and that the recall campaign was begun because Mr. Vasquez wanted to raise taxes in the very conservative county of Orange County. She added that Mr. Vasquez knew what it was like to be poor. Senator Sarbanes said that the time was past to give someone a chance for a position of this importance. Senator Sarbanes said that the time was past to give someone a chance for a position of this importance that could affect the United States on the World scene and that this was dramatically underscored by the events of September 11. He said that he knew the political game and how they wanted to give someone a chance but the SEC report stated that Mr. Vasquez did not fulfill his obligations as a Supervisor. Senator Boxer responded that Clinton appointed a political operative as Director of the Peace Corps and no one said anything about it. Senator Boxer responded that the supervisors had been investigated by everyone, that he had a long career of public service beginning as a police officer. She said she felt very upset about the opposition to Mr. Vasquez, she said the Peace Corps people who opposed Mr. Vasquez were very well meaning and that any one of us might have wanted to support someone else, but the fact is that Clinton appointed a political operative as Director of the Peace Corps and no one said anything about it. 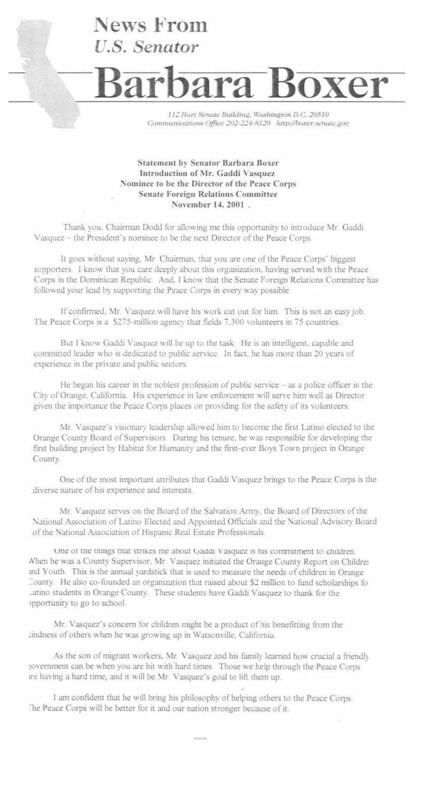 Senator Sarbanes responded with the LA Times editorial that "Vasquez proved to be a timid public official, the antithesis of what a Peace Corps director should be." Sarbanes responded by reading from the LA Times editorial that said that "Vasquez proved to be a timid public official, the antithesis of what a Peace Corps director should be. He, along with his colleagues, had been asleep at the switch. That doesn't inspire much confidence today in his ability to lead in the international arena or run a large bureaucracy." Senator Dodd went on to say that one thing that can give us comfort is that Jody Olsen has already been approved as Deputy Peace Corps Director, that she is well qualified, and a wonderful asset to the Peace Corps. Senator Rockefeller closed the debate by saying that the Peace Corps was at stake. A roll call vote was taken and the Senators responded in turn with the final vote of 14 for and 4 against the nomination. Votes for Mr. Vasquez were cast by Senator Joe Biden of Delaware, Senator Chris Dodd of Connecticut, Senator John Kerry of Massachusetts, Senator Barbara Boxer of California, Senator Robert Torricelli of New Jersey, Senator Bill Nelson of Florida, Senator Jesse Helms of North Carolina, Senator Lugar of Indiana, Senator Hagel of Nebraska, Senator Smith of Oregon, Senator Frist of Tennessee, Senator Chafee of Rhode Island, Senator Allen of Virginia, Senator Brownback of Kansas, and Senator Enzi of Wyoming. Senator Rockefeller of West Virginia, Senator Sarbanes of Maryland, Senator Feingold of Wisconsin and Senator Paul Wellstone of Minnesota cast votes against the nomination. Senator Sarbanes cast a vote against the nomination. Senator Rockefeller cast a vote against the nomination. Senator Wellstone cast a vote against the nomination. Senator Feingold cast a vote against the nomination. This committee vote to approve Gaddi Vasquez as Peace Corps director was a big mistake, but it may still be corrected by the full Senate. If not, I hope this director's on-the-job training does not prove to be fatal to either the agency or to any volunteer who serves under this administration. Unfortunately, this will truly be a case of time will tell. Well, this is truely a political issue. Not many people [eg Dodd] want to expend any political capitol on this issue. What we RPCV' are now challenged to do is to hold Vasquez's feet to the fire. We need a forum such as this one to keep everyone informed of all of the 'sneaky' stuff that goes on [or doesn't go on that should] and keep up a clear drum beat to our national leaders [especially those like Dodd]. We need to do this both to try to influence Vasquez as well as to make it abundantly clear that we take this position and it's operation very seriously and we intend to 'tend' to it with diligence. This definitely falls under the heading of our commitment to influence the US on our return. John C and Barbara F have probably exhausted their energy reserves as the year ends. Others must step forward to assume the pilot's role on this tugboat, sometimes pulling, sometimes pushing Mr. Vasquez' barge. We need to be gracious and diplomatic, "good losers" as it were, with a dose of optimism that Mr. V. has a capacity to work hard, learn quickly, communicate well. He has a large tutorial committee to point the way. That is what our commitment to Peace Corps operations has to mean. Being mean or damaging from the start will alienate a lot of well-intended folk. I am very disappointed that the nomination was approved. If George W. Bush's desire to choose a Latino for the position was truly sincere, I must say that there are actually qualified Latino Republican RPCVs with a great deal of international experience who could have been tapped for the position. I guess none of them donated enough money to W.'s campaign. I must say that it is strange for a senator to be upset at citizens banding together to oppose a nomination. While politicians must vote their conscience, it is usually their job to uphold the will of their constituents. In the case of members of these important committees, a senator is obligated to do the right thing, and not what is politically expedient. More power to the four who voted against Vasquez. If Mr. Vasquez does become director, we will have to become more involved and aware about the workings of PC. We should anyway. I have to say that Sen. Dodd's comments to the effect that we are ok since Jody Olsen is well qualified for her position worry me the most. It is a clear case of "give the man ùÙÄP�øe woman the �¡0onsibility". Leadership within the Democratic party has come down to 4 men. What will the wannabe leaders do? That the Senators from California supported Vasquez is no surprise. They seek to destroy the Bill of Rights and pat themselves on their backs because they are being "active" and "doing things." Obviously, they have added the Peace Corps to their list of things we will be better without. I think we RPCVs need to realize that unless we are organized for political action -- and we have the numbers and the places in the power structure to do this now -- we will never become the effective voice that we should and must be in our country, especially for foreign policy initiatives in developing countries. After Sept. 11th, I didn't think I could be shocked, saddened, or in any way more cynical than I already was. However, reading about the Democratic senators' responses to this nomination proved that I still had sensibilities and expectations that could be flattened. Boxer's boo-hooing about how unfair and misguided the opposition is would have amused me, if the stakes weren't so high. As a life-long Democrat I hate to say it, but she proves the stereotype of the knee-jerk, shrill, fanatical liberal. Dodd's comments, to the effect of "hey don't worry, there's already a qualified deputy in place" is repugnant. Here again, we see an unqualified MAN (sorry, fellas) in place, making the big bucks and getting the prestige, while the better qualified woman is several steps below on the ladder, doing the job, catching the mistakes, and getting paid a whole lot less. Psst - Senator Dodd - the Sixties are over. All I can take comfort in is that this guy will ultimately screw up and get canned. Unfortunately, a lot of damage will be done in the meantime to an agency and an idea I cherish. To exercise my sense of patriotism, as a woman, I served in Peace Corps/Colombia from 1966 to 1968, the same time that Sen. Dodd served in the DR, the same time that Sen. Kerry served in Vietnam. Since then, as a citizen, I have gone the full political spectrum--Republican to Democrat to Independent, now known as "Unenrolled." It seems that the two senators, however, have simply become politicians. Kerry often invokes his Vietnam war combat and Dodd his DR peace volunteerism, when politically expedient. They seem unable to stand aside and vote either according to their consciences OR according to the wishes of their constituencies. I have read Jody Olsen's statement and I've read of the Senators' admiration and unanimous vote for her appointment as PC Deputy Director. After reading the committee hearings, Vasquez comes nowhere close to Olsen's qualifications. But then, she didn't contribute $100K to anyone's political campaign. Shouldn't political $$$ simply be forgotten post-Sept. 11? Shouldn't Pres. Bush simply WANT the most qualified person to conduct PEACE, just as he got the most qualified persons to conduct WAR? Presidents always take chances with political appointments--sometimes they work out, sometimes they don't. For example, Paul Coverdell was one of our best directors while Elaine Chao definitely was not. But with 162,000 well qualified returned Peace Corps Volunteers from whom to choose, many of whom are already actively employed in the government, the President and the Senators could do better than appointing Mr. Vasquez. I think everyone is going to be greatly surpised on how good of a nomination Gaddi Vasquez turns out to be. Speaking from a PC hispanic point of view he was the best decision for the PC.